A luxury housing development in Nevada has started construction on the Lake|Flato-designed “Inspiration Home,” one of seven homes in the new development designed by renowned architects to give “design inspiration” to future residents. ASCAYA is carved out of the hilly volcanic rock of the McCullough Range in Henderson, and is arranged so each lot has a view of the city and surrounding mountains. Its elevation at the highest point is 3,000 feet, and the remaining spots are sought-after: One of its 313 lots coming in at just a little over an acre recently sold for $2.6 million. Lake|Flato’s inspiration home is a single story and measures 9,000 square feet, with four bedrooms and a four-car garage in addition to a large living space. The master bedroom opens into a private patio aimed at nearby Las Vegas. Sustainability and the landscape are integrated into the design of the house. Its walls are made of rammed earth, which blends into the surrounding rock as well as providing great insulation for the location’s hot climate. The main living space also opens up into an outdoor courtyard. This is the third of seven inspiration homes to break ground on the site. Others were designed by Swaback Partners, SB Architects, Hoogland Architecture, Marmol Radziner, and Backen, Gillam, & Kroeger. Richard Meier, Pritzker Prize–winning designer of the Getty Center, contributed one of his signature all-white homes. Lake|Flato’s philosophy of blending the house into its desert surroundings is reminiscent of Frank Lloyd Wright’s own home and school in the desert, Taliesin West. When building the compound in Scottsdale, Arizona, he was mindful of integrating the house into the rocky landscape to the point of literally building its walls with local rocks. John Sather of Swaback Partners is a graduate of the Frank Lloyd Wright School of Architecture. 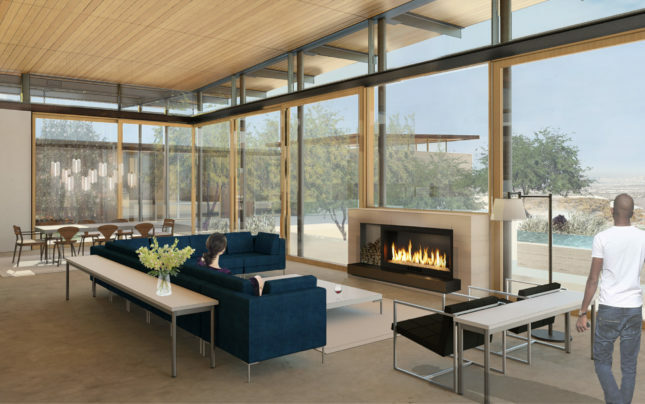 All these homes are in a style that could be described as “desert contemporary,” setting the tone for architects who will design buildings for the development later on. Adding to that aesthetic is a luxury clubhouse designed by Swaback Partners that will include a fitness center, spa, and pool.